DURHAM, N.C. – North Carolinians who buy their own health insurance will pay more for their premiums in 2017. Health insurance premiums are determined by the cost of health care services and how often they are used. Blue Cross and Blue Shield of North Carolina (BCBSNC) customers who enrolled in the Affordable Care Act (ACA) continue to be older and less healthy, and use a high volume of expensive health care services. As a result, BCBSNC filed for an 18.8 percent rate increase with the North Carolina Department of Insurance (NCDOI). NCDOI will review the requested ACA rates and publish approved 2017 premiums late this summer. Receive a higher volume of orthopedic procedures. “Since the ACA’s first enrollment period, we’ve continued to see a large number of older and less healthy customers enroll in our individual ACA plans as compared to our other customer groups,” Tajlili added. 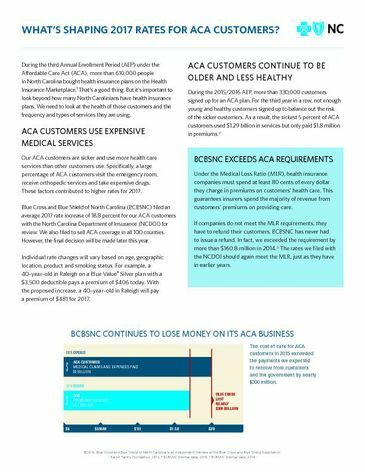 BCBSNC plans to sell ACA health insurance plans on and off the Exchange1 in all 100 North Carolina counties, but the company will make its final decision on ACA participation later this year. The company paid out a staggering $1.29 billion in claims for the sickest 5 percent of ACA customers’ medical care in 2015. That’s over 70 percent of BCBSNC’s total ACA revenue last year and one example of why the company has lost more than $400 million for the first two years on its ACA business and is evaluating its participation in the ACA. The company will file a list of counties where it will sell ACA plans with the Centers of Medicare and Medicaid Services in late August. For more information, visit blog.bcbsnc.com.